The train of thought here is; how long is it wise to pause a personal pension so you want to invest elsewhere and is it worth it? It’s a question I’ve been asking myself and decided to run a small bit of maths to help. We all want the same thing. To have a fulfilled career followed by a happy retirement whereby we have enough financial assets (whatever they be; savings, pension, shares, property etc) to support ourselves. All-in-all the aim is simple, I want to be a happy pensioner drawing love hearts in the sand! I’m sure you feel the same. I better start by saying that I am strictly referring to the type of private pensions you have where you pay in how much you want when you want. Lots of self-employed people have them. Company pensions are different. My personal private pension is with a provider called “ReAssure”. I’ve had it a couple of years, I can’t remember the current balance of it at the last statement, it’s only around £2,000. Recently I’ve paused it so I can focus my money on other things, like this website! I don’t have enough cash to do everything so something had to give, I decided that for now the pension would be one thing to put on hold for a while. The pension I have is linked to a stock exchange fund, there are lots of funds with varying risk levels, mine is slightly on the safer side. 5 Why such a massive difference? The fact the pension is linked to the stock exchange makes doing any kind of reliable comparisons impossible. Why? Because the stock market is unpredictable. Simply guessing “the fund value will rise on average 2% per year” won’t bring out realistic figures. However, I still want to get an idea. Plus there is the potential in a few years to maybe mix up a savings pot and a traditional pension. Unfortunately interest on savings is very low at the moment but it may not always be that way. For the purpose of this I’ve decided to still run some figures to give some sort of picture. However for the reasons above please take the numbers with a pinch of salt. I am going to have to create a scenario now, based on my current thinking. I’m currently 29 meaning many years of working ahead of me. Let’s say I put pension deposits on hold for 5 years. That should give me long enough to invest how I want to. I will have the pension for 40 years before I stop paying in and take the pension. Let’s put a nice round target for the final pension value of £400,000 (remember there will have been 40 years of inflation, 400K in the year 2057 won’t buy anywhere near as much as it will now). Also, remember I would be receiving state pension on top of that. For the sake of this let’s pretend the pension gains 2% each year. Let’s take a guess at inflation rises at an average of 2% per year so I need to put in 2% more per year to keep up with inflation. I only want to work out rough figures for this to gauge the impact. I tried using some online pension calculators but they weren’t really suitable for my needs. I ended up using regular compound interest calculators to help me. Here is how the maths ends up. To reach a total of £400,004 I would need to put in £375.25 every month for 40 years. Obviously the £375.25 per month would go up 2% per year with inflation. Here are screenshots of the inputs and results. 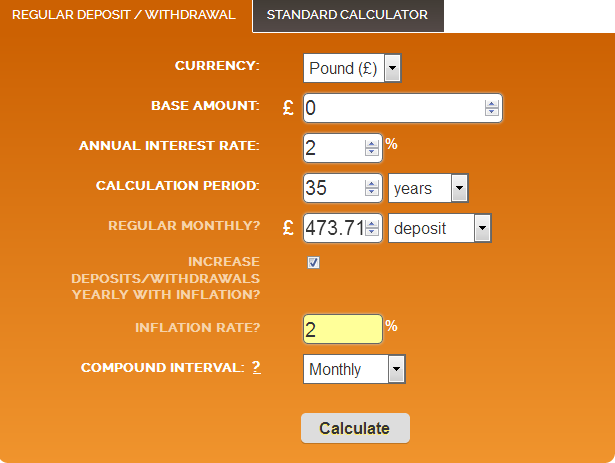 My existing ReAssure pension of £2,000 will end up being £4,448 after 40 years. Which nicely highlights the power of compounding. I will now do a separate sum to get the extra £395,552 needed. But this will only have 35 years to be achieved. The numbers now look very different! To reach a total of £395,556 I would need to put in £473.71 every month for 35 years. 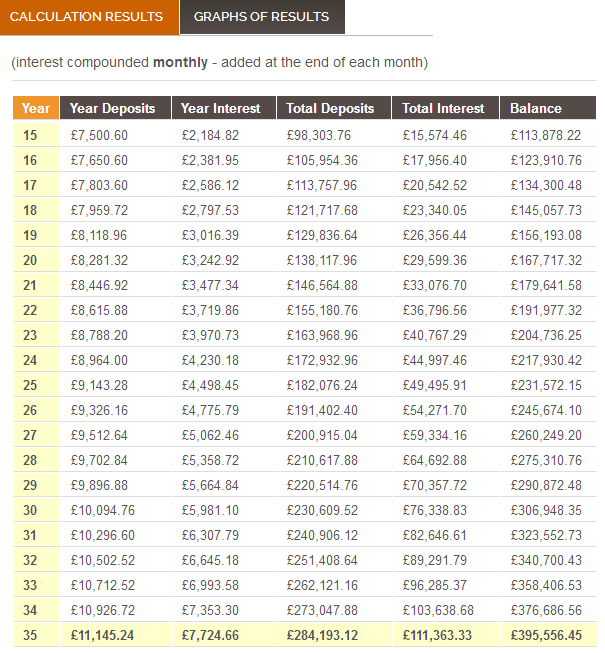 Almost a full £100 more per month, a huge difference! Here are the screenshots of the calculations and the last 20 years figures. Why such a massive difference? 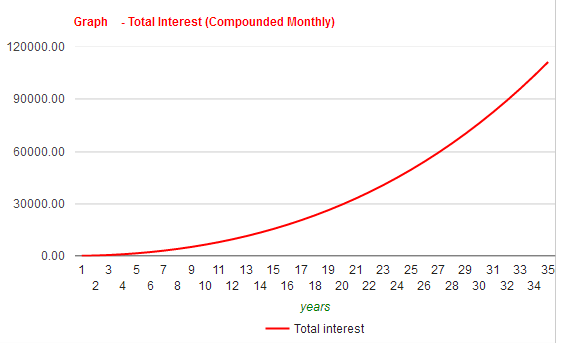 It’s not only the fact that the same amount has to be saved in 5 fewer years, but also a lot of lost compound interest, which really kicks in during the final years when the balance has been built up, as you see in this demonstration graph. As I said earlier, please take the exact figures with a pinch of salt. What my calculations did was highlight the huge difference it can make. The yearly percentage gained, and yearly inflation are impossible to predict, who knows what the world will be like in 30-40 years time! However, this does give a nice visual impact of the difference it can make. Without stating the flipping obvious – the more years you have to save your pension, the less you need to deposit per month! That may be ridiculously obvious, but what isn’t obvious until you do the maths is how brutal the impact is. It is worth pointing out that these figures are specific to me, when my pension is at the early stages. It would be different for someone who already had £100,000 in a pension to then pause it for a few years. Each year you would still be getting a 2% increase per year, if you paused for 5 years it would still have gone up to £110,507. This is worth remembering if you want to do the figures for yourself, which if you already haven’t then you definitely should. Everybody who thinks about pausing their pension to use the money in other ventures, will come out with different figures. I’m not actually going to change my plans of what I want to do as a result of this, but I am going to work harder to get the pension going again as soon as possible. You might also want to evaluate your situation and run some calculations right now to make sure you have a clear plan on how things could pan out in your retirement. As I posted recently, lots of people expect to need financial held from their kids when they’re older. I’m glad I’ve done this now, you might be too!